It may not be the talk of the town, but it’s a hot topic in our realm nonetheless: Placing migrants in regional Australia. Of the 190,000-strong permanent migrant annual intake, our current visa system diverts about 5,000 individuals to regional areas. In keeping with Australian public discourse tradition, we have two sides to this topic. Those in favour, and those opposed. Those in favour argue that sending migrants to regional areas will ease congestion in major cities. It only takes one attempt to drive down Punt Road at 5:30 pm on a weekday to know that congestion is an undeniable issue in Eastern Hubs of Australia. Further, proponents of this idea argue that making new migrants live in regional Australia will ease the cost of living (have you seen the housing market recently?! ), whilst also stimulating growth in regional areas. Those in favour also claim that distributing individuals in regional areas will prevent the development of urban ghettos (luckily gentrification seems to be keeping that one under wraps), and will aid these migrants in integrating into the community. On the other hand, those in opposition argue that forcing migrants to live in a specific location is arbitrary: it is unlikely to work, and is inherently unfair. You may already have a strong opinion on this matter. But hey, humour us. Let’s have a closer look. As to the argument that such a distribution will prevent the development of “urban ghettos” and aid in integration – well, this is controversial to say the least. Primarily, there’s a vast and widely-accepted body of scholarly literature that evidences the importance of support networks in successful integration. Have you ever been to a party and not known anyone except the host? Now imagine you were in that situation on a permanent basis, and the host is actually an invisible government body that is too busy hosting to introduce you to anybody. Arguably, there is also an inherent tension between a forced settlement programme and the western libertarian tradition. Centrally planned economics doesn’t really go down well with a lot of Australians. Plus, the question of fairness is often raised in this context. Then there is the overhanging question of “is there even a point?” The figures in this context seem to say, “Well, not necessarily…” Actually, the figures seem adamant that 1 in 10 of the people who immigrate to regional Australia debark for the bigger cities within 18 months of arrival. Even creating a system wherein the visa is conditional and dependent upon the individual’s residence in the regions, once someone is in Australia, the ability to police their behaviour and movement within the country is limited and requires serious resources. Having said that, however, the vast majority of migrants do comply with their visa conditions. In any event, the law provides extensive measures to deal with instances of non-compliance. The question remains, if there was a mandatory settlement period wherein a migrant’s visa came with the condition that they live in a regional area for a predetermined length of time, what happens when that time comes to an end? Well, a huge proportion of people, particularly young people, move to the bigger cities in search of more opportunities. If 5th generation Australians are moving out of our regions in swarms, what is the motivation for a migrant to stay beyond the mandatory period? People follow opportunities and migrants are no different. 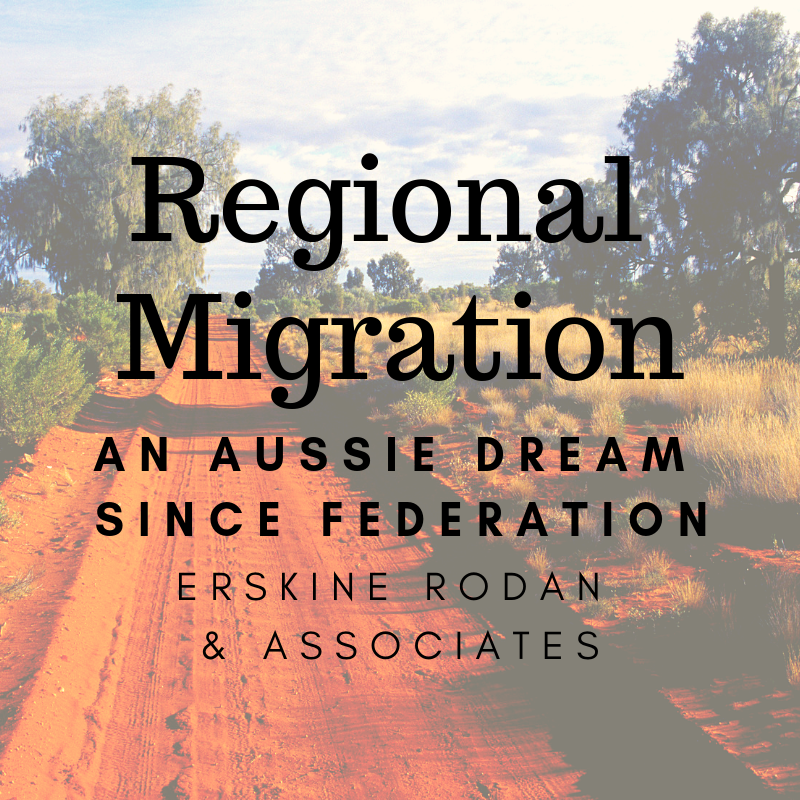 In the absence of any serious infrastructure development in regional Australia, the likelihood of migrants settling in regional Australia in the long term is slim. The idea of developing regional areas and achieving a better distribution of our immigration programme has long been popular. But – is it realistic? The moral, economic and practical implementation of the debate seems to indicate the answer is a firm “no”. As is often the case, the devil is in the detail… and as such, it is probably worth waiting for the details on this one.